On 26 July the Government announced its Air quality plan for nitrogen dioxide (NO2) in UK (2017). The objective of the plan is to reduce concentrations of NO2 around roads where levels are above legal limits and to do so within the shortest possible time. To achieve this the Government has directed local authorities to create their own draft plan to achieve this by March 2018. The need for new plans is telling in itself as all local authorities with air quality issues are already required to have a plan by the 1995 Environment Act. In that act it set out the limits for NO2 that should have been met by 2005 but are still not being met today, some 12 years later. With an estimated 40,000 early deaths per annum attributable to air quality that means some 480,000 people, and their friends, families and loved-ones, have suffered as a result of existing UK-wide plans not being fit for purpose. That’s not to mention the millions more, including people in and around Gosforth and Newcastle, who will have suffered as a result of other medical conditions linked to poor air quality. The new Government plan goes on to state that the most effective way of meeting NO2 limits will be to introduce Clean Air Zones (CAZ) where higher-polluting vehicles are charged to use roads in the zone. The existing NO2 exceedences necessitating the respective AQMA’s [Air Quality Management Areas] in Newcastle and Gateshead may be resolved through “natural” vehicle replacement. An LEZ [Low Emission Zone] needs significant ongoing investment from both LA’s [Local Authorities] as revenue will be significantly lower than operating costs. Implementation would need to use existing ANPR [Automatic Number Plate Recognition] and CEO’s [Civil Enforcement Officers] within NCC/GMBC [Newcastle and Gateshead Councils’] control to minimise ongoing costs. Avoidance of the LEZ rather than conformity could cause traffic redistribution leading to increased congestion on non LEZ mandated through routes. Alive after Five policies would be fundamentally at odds with LEZ and retail revenue vs. air quality argument would be created. As well as diesel-gate, which meant that ‘natural’ vehicle replacement did not result in the expected reduction in emissions, the High Court has also since ruled out economic considerations such as point 4 as reasons not to act on air-quality. If the Alive after Five policy is not compatible with UK law then clearly it should change in the same way as if any other Council policy was found to be non-compliant. It should not be, and should never have been, used as an excuse not to act on an urgent public health issue. The Council can however propose alternatives, but only if they are demonstrably at least as effective as a charging Clean Air Zone. Clearly, just waiting for natural vehicle replacement as proposed by the Capita report will not fit this criteria. 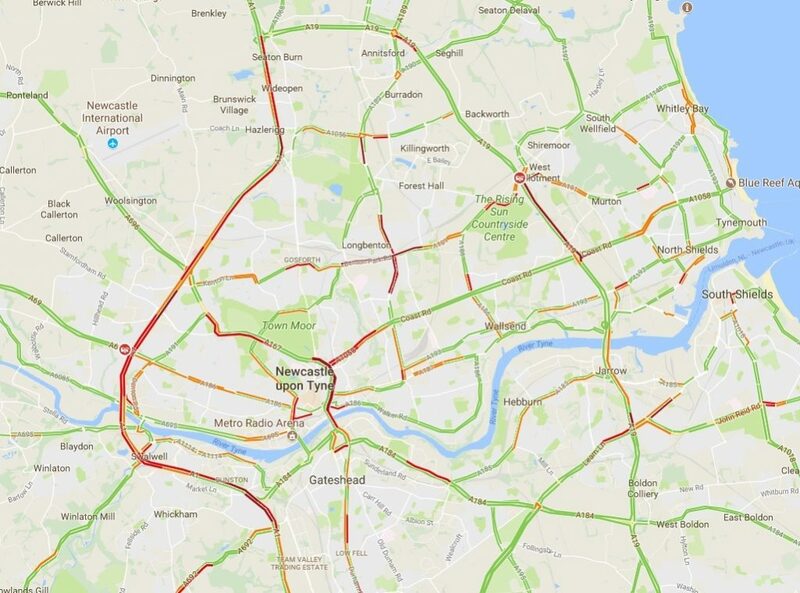 For Newcastle and Gateshead, DEFRA has identified locations on the the A1 bypass, the Coast Road and the Tyne Bridge where air quality is the worst. The latter two are part of the Newcastle City Centre Air Quality Management Zone, which we wrote about here. That’s not to say that Newcastle City Council can ignore air pollution in the City Centre itself, which is still over the limit, or in Gosforth where levels currently just under the limit could be made worse as a result of induced traffic from road ‘upgrades’ or from additional traffic from poorly planned new estates on the edge of the city. Looking at the Google Traffic website (see below) it is clear that these locations, which are all on major roads, are already heavily trafficked. Green routes on the map below mean traffic is flowing freely and red routes are where there is heavy traffic. This snapshot was taken during the summer school holidays so at other times of the year could be even worse. Clearly these traffic volumes are more than those routes can cope with and still have free-flowing traffic. Although it is often stated that adding road capacity to relieve congestion is a good way of reducing air pollution, studies have shown this is not the case. Congestion, as well as slowing traffic, also acts as a limit to the total amount of traffic and therefore pollution on a route. Where roads are widened to include additional lanes that invariably leads to additional ‘induced traffic‘ and possibly also to higher levels of pollution. For the A1 bypass this could be a serious issue. Traffic widening on the section identified by DEFRA has already happened and further widening, further north and south, will cause even more traffic to use that route. The required plans will need to take account of this and introduce measures that counteract this effect. 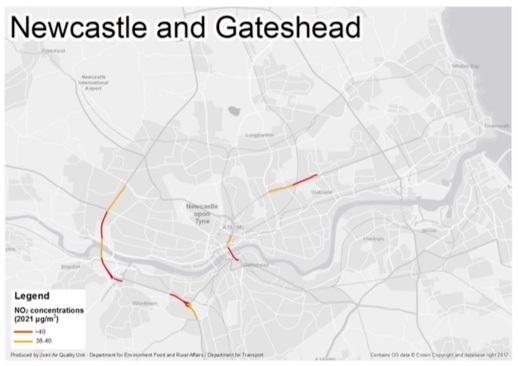 Gateshead Council’s plan will also need to involve the Gateshead Metro Centre given the high levels of traffic (and therefore pollution) it generates and the impact of that pollution on customers and staff. While there are options for how to access the Metro Centre, massive incentives such as 10,000 free parking spaces, funded indirectly by all customers whether they drive or not, and hundreds of millions of pounds of tax-payer funded investment in surrounding roads means that most people who can drive will. With the imperative to act on air quality it is unlikely that such a skewed model can be sustainable. The new plans to be proposed by Newcastle, Gateshead and North Tyneside Councils will need to be a step change from the current plans if they are to meet the Government’s directive of meeting air quality targets in the shortest possible timescales. Now the Government has delegated planning to local authorities, Councils also have an additional incentive to do this as if they do not they could be liable to legal challenge. In Germany this is already happening and Stuttgart has just been ordered by a court to restrict access to the city by diesel vehicles from 1 January 2018 because the plans they had produced were inadequate. Newcastle City Council has already started consulting with stakeholders including bus companies and business owners about how to address air pollution, which is a good start. It also urgently needs to engage with residents to set out a vision of a healthy city with clean air, vibrant local centres and good quality choices for how we travel including walking, cycling, bus and metro. In doing so it can turn this ‘negative’ that has blighted the health of generations into something positive for the future of the city and the surrounding region. Stuttgart is only the first city in Germany and others will follow. The first step is to get rid of all Diesel vehicles, the second step will be electric cars. German’s Green party advocates this for 2030, but the Car industry lobby is too strong. Nevertheless, this development is unavoidable. Why should we not try to accelerate this ? First step, make all buses electric, and get rid of old Diesel cars ?